We ask all of our patients to take care of their fees on, or before, the day of their treatment. For your convenience, we accept cash, checks, and credit card payments (MasterCard, Visa, American Express and Discover). 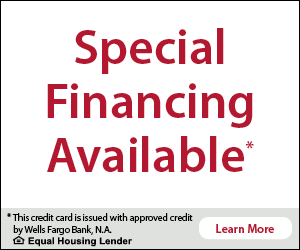 If you wish to make extended payments, we have teamed up with Care Credit and Wells Fargo to provide financing options, with approved credit, that will allow you to pay over time. You may apply on line by clicking one of the links below, however if you have any questions one of our staff members will be happy to assist you. They also offer 12.99% APR for 24 months** and 12.99% APR for 36 Months*** with equal monthly payments. Click here for financing terms and conditions. Follow the link in the banner below to apply now! We are also a provider for Delta Dental Insurance and other major plans. If we are a provider of your plan, we ask that you pay the estimated portion of your treatment on, or before, the day of your treatment. For our patients who may have any other dental insurance, we ask that you take care of your fees on, or before, the day of your treatment. We are happy to process your dental claims as a courtsey.